WE LOVE MUSIC and that shows in the select range of products we sell. We put each new piece of equipment through our stringent listening tests, and if it doesn't pass, we don't sell it. Hearing your favourite piece of music on one of our systems is like hearing it for the first time. It will send shivers up and down your spine, and cause the hairs to rise on the back of your neck. This quality is not limited to just one room, but can be infused into every room of the house. Soak in the bath while listening to your favourite album, wake up in bed to the dulcet tones of the radio in the morning, or entertain guests in the barbecue area on a hot summer's day. Controlling the system is child’s play. 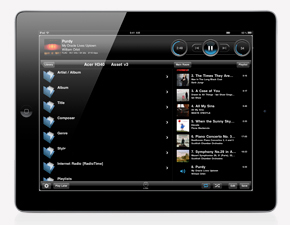 You can use your Smartphone or Tablet PC to access your entire music collection, so you can walk around the house controlling any of the rooms you are in wirelessly. You can even group the rooms together if you are having a party, so the same piece of music will be playing in every room, even the garden! We specialise in Linn systems, and have been selling and installing Linn equipment since 1995. We are the longest established Linn agent in Ireland. This invaluable experience insures that you get the best performance from your Linn equipment, and a level of service that is unrivalled. (Don’t just take our word for it, please have a look at our testimonial section for our clients views of our work). We also specialise in fixing Linn systems installed by other dealers in the past, and can usually bring them back to life. From a 35 year old LP12, right up to their current award winning DS equipment, if it has a Linn badge on it we can advise and help. Music in any room of the house, all at your fingertips. Link all equipment to a single control, including iPhones, iPads and Android devices Keep clutter to a minimum by linking all playing sources to any TV in the house. Your friends can even play music stored on their iPhones wirelessly, a party favourite!